If you’re stuck in a “beer and wings” rut, you need to broaden your horizons. It turns out suds pair just as swimmingly with pork belly, fancy cheese, and quite possibly the best French fries you’ll ever encounter. Take a look at the DC area’s five foodiest breweries and brewpubs that go way beyond inviting in a few food trucks on weekends. Courtesy of Caboose Brewing Co.
Vienna’s Caboose Brewing Co. merits first mention because gourmand beer guzzlers are met with small plates that skew fine dining: braised Virginian pork belly (pictured); line-caught Atlantic salmon with vanilla-infused parsnip puree; gulf shrimp and Anson Mills grits with spicy Pennsylvanian pork sausage; and sweet potato doughnut holes that take Dunkin’ to the cleaners. The menu is a bible of Virginia’s bounty thanks to Chef Brandon McDermott’s chumminess with local farmers and a pension for foraging (so hot right now). Oh, and just for kicks they have a nutritionist on staff. 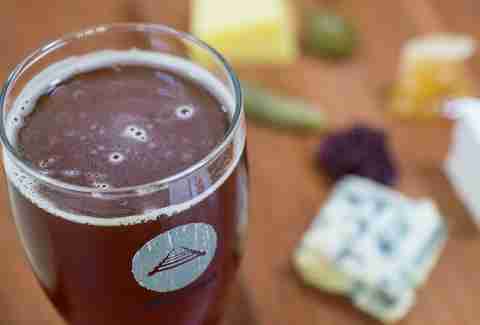 Caboose Brewing Co. also proves that beer and cheese trumps wine and cheese once and for all. You’ll see what we mean when you go funk nasty and try Millwood Springs organic blue cheese with the brewery’s spicy Ghost Train pale ale brewed with bhut jalokia (aka ghost peppers). Another killer combo: Yellow Spring Farm Fieldstone goat’s milk cheese with Vanilla Bean Hobo imperial stout. The stout’s aged on Madagascar bourbon vanilla beans. See, even their beers pull inspiration from the kitchen. 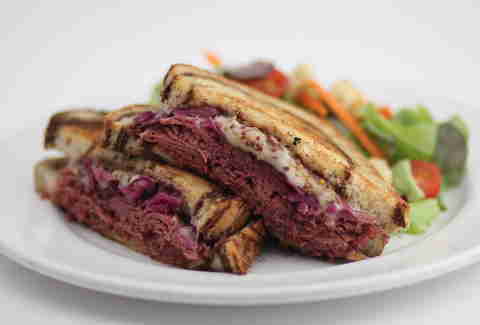 Meet the Rolls-Royce of Reubens. Why? That’s wagyu in there, along with radicchio kraut, whole-grain ale mustard, Russian dressing, and Swiss cheese on rye. This decadent sandwich is just one example of what Travis Weiss brings between the bread at Glover Park’s new taproom. You want to visit for his insane burger specials on Wednesdays, too. A December iteration was more Louisiana than the Superdome: blackened 8oz patty, dark roux mayo, gumbo gravy, charred Andouille sausage, bleu cheese, and grilled shrimp. You knew the beer would be good, but damn, try Travis’ food before Food Network scoops him up. That’s not to say sandwiches are the only way to go at Mad Fox. Enter a strong line-up of what they call “Sociables.” Aren’t you glad they didn’t say small plates? You don’t have to hate them. Start with pork belly confit with Korean BBQ sauce (pictured); then dive into pumpkin hummus served with focaccia; and finish things off with an order of frickles because it's fun to say. If you brought your second stomach, also hit the chef plates that take comfort food and inject it with cool like a turnt take on fish & chips or meatloaf that would make your mother puddle at the floor like Alex Mack. Gone are the days of scarfing BBQ at Denizens Brewing Company. This fall, the brewery cleaned house and launched a brand new menu with Josh Warner wearing the (chef) pants. You know Warner from his mad skills at CapMac -- DC’s roving mac and cheese truck. The gig at Denizens lets him flex his culinary muscles in the form of fries that make you say WOAH. 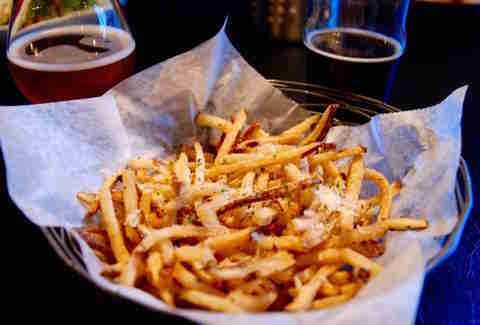 His “Freedom Fries” are dusted with Manchego cheese, smoked duck salt, and fall herbs. 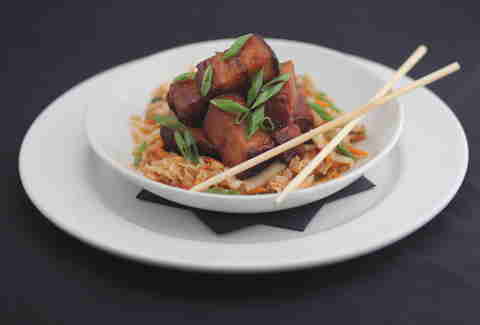 Other can’t-misses introduce ingredients from the brewing process like pork belly served on toast made from spent grain or pretzels that are boiled in wort and served with a cheese dip flavored with the brewery’s Mildy Soba Brown Mild. You’re also going to want the burger. 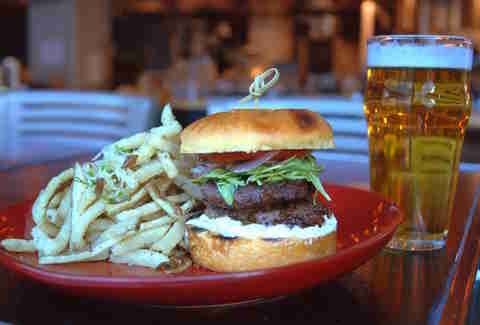 The stack includes two brisket patties, arugula, pickled onions, whipped goat cheese, and spiced bacon on brioche. 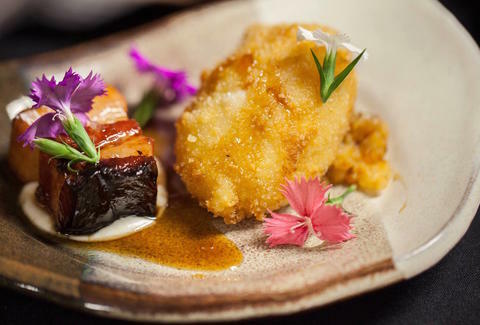 If you know what’s good for you, you’ll save room for dessert because Denizens snagged Viviana Nunes -- a pastry chef whose resume includes VOLT, Toro Toro, and Mango Tree. One of her fall specialties is a “messy pumpkin pie” with pepita seed brittle, Ponch’s porter gelée, pumpkin mousse, and a shortbread crisp. Bet you were expecting hush puppies and tots, but surprise! Look at this watermelon Jolly Rancher-colored salmon. Don’t worry -- it gets its dramatic hue from being brined with beets, not rejected Halloween candy. This looker is just one example of how Bluejacket has stepped up its food game to match its unparalleled brews. That’s not to say the smothered tots dressed in cheddar and Tasso ham gravy have vacated -- you can still get those bad boys. But then move on to pan-fried cheddar pierogies, diablo mussels, and an epic sandwich containing currywurst, knockwurst, bacon-liverwurst, Swiss, lettuce, red onion, and curry ketchup. 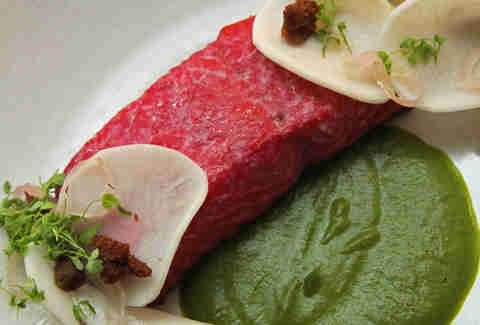 The Bluejacket kitchen really slays it at oh-so-trendy seasonal cuisine. That’s why the menu right now reads like a farmer’s market detonated on its pages. 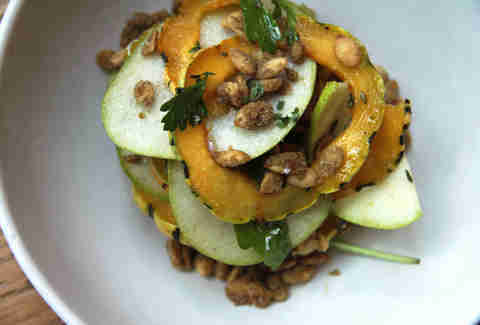 Take these butternut squash slivers with green Anjou pear, candied pumpkin seeds, sage, and champagne vinaigrette. Joining this healthy dish are other fall hall of famers: roasted Brussels sprouts with maple syrup glaze; duck confit pot pie with root vegetables and a caraway crust; and pan-seared scallops with spaghetti squash and pistachio purée. Raves about Right Proper’s fried chicken sandwich go like this: “it tastes like Chick-fil-A.” If you thought that you’re wrong. 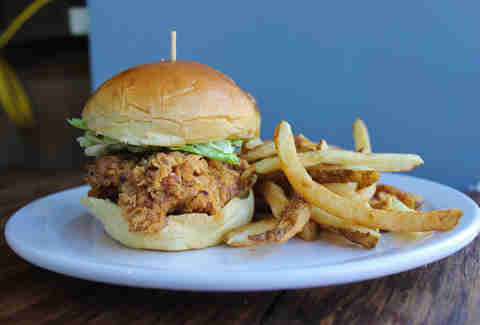 Right Proper’s “Southern Fried Chick-Filet” is far superior based on flavor, not on politics. Its crunch could wake a sleeping bear (note: do not eat it around bears) and the toppings don’t take away from the chicken (just Boursin cheese, pickles, lettuce, and tomato co-star). Once you add those hand-cut fries (ask for the horseradish dipper) your meal will be complete. You can’t get the fried chicken sandwich every time you hit Right Proper. Okay, maybe there are no rules against that, BUT if you visit on a Monday take advantage of their gooey fondue special available at the front bar. Your $15 crock will transport you to Switzerland -- only the beer will be better. 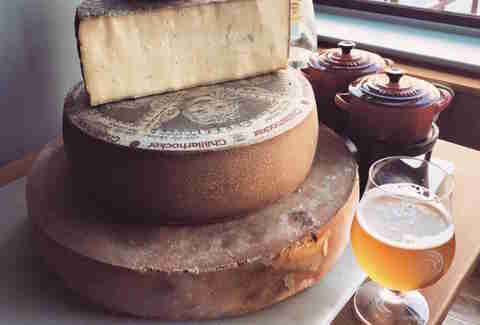 The fondue is a part of the brewpub’s extensive cheese program. Other can’t misses off Chef Sarah Biglan’s menu include pork rind nachos, the fried green tomato sandwich, and a heavenly hash sundae for dessert. Not that kind of hash. Laura Hayes is a DC-based food, drink & travel writer who also contributes to Washington City Paper, Food Network, Arlington Magazine, and others. 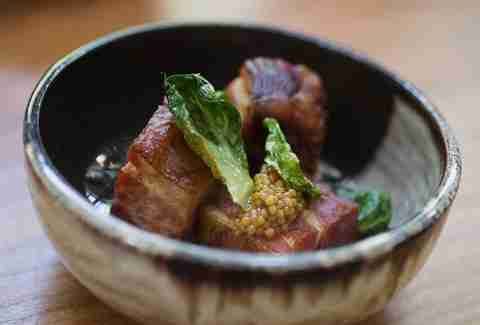 Find her subbing beer calories for pork belly at all of these spots. Follow her on Twitter @BTMenu.